The second half of the season will be out on DVD in late December. You can pre-order it on Amazon. OVERVIEW: The critically acclaimed drama from executive producers Ronald D. Moore and David Eick comes to a thrilling climax in “Caprica” Season 1.5. Fifty-eight years before the events of Battlestar Galactica, mankind is wrestling with the question of what makes one human, and sealing its own fate of certain destruction. Alliances are made, secrets are revealed and lives are forever changed while the conflict between man and machine takes shape. As the season races towards its stunning conclusion the seeds are sown for the inevitable, brutal clash between the newly-born Cylon race and its human creators. 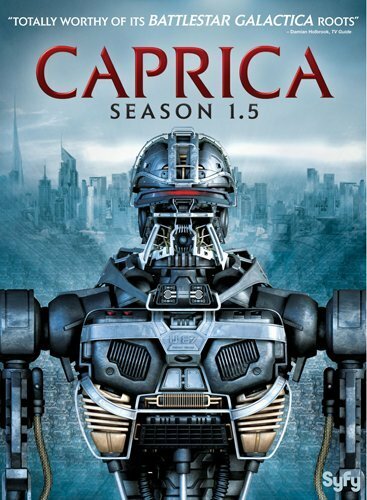 “Caprica” Season 1.5 stars Golden Globe®-nominee, Eric Stoltz (Pulp Fiction), Esai Morales (“NYPD Blue”), Paula Malcomson (“Deadwood”), Alessandra Torresani (“Happy Campers”), Magda Apanowicz (“Kyle XY”), Sasha Roiz (“In Plain Sight”), Brian Markinson (“The L Word”) and Polly Walker (Clash of the Titans). 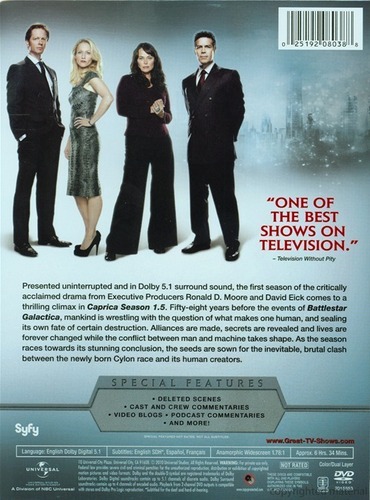 Debuting on DVD on December 21, 2010 from Universal Studios Home Entertainment, “Caprica” Season 1.5 features the series’ final five episodes, yet-to-be aired in the U.S., as well as video blogs, podcasts and commentaries. GLOBAL DEFENSE: Join Agent Duram (Brian Markinson) as he lifts the lid on the GDD. NEXT GENERATION: The cast and crew discuss the emerging talent and technology on the show. SOUNDS OF CAPRICA: Go behind the scenes with executive producer David Eick and music editor Michael Baber to hear how the unique sounds of “Caprica” are created. THE MUSIC OF CAPRICA: Composer Bear McCreary discusses the sounds of “Caprica” and the music that forms the show. PODCASTS with executive producer David Eick, director and series stars, Eric Stoltz, Magda Apanowicz, Esai Morales and Sasha Roiz. FEATURE EPISODE COMMENTARY with executive producer Kevin Murphy. Posted in: Caprica, DVD News.